This week we kicked off the ‘Let’s Get Cooking’ resident social in Smoketown. It took place formerly known as the Historic Presbyterian Community Center on South Hancock St. It’s always such a pleasure to fellowship with Smoketown residents. 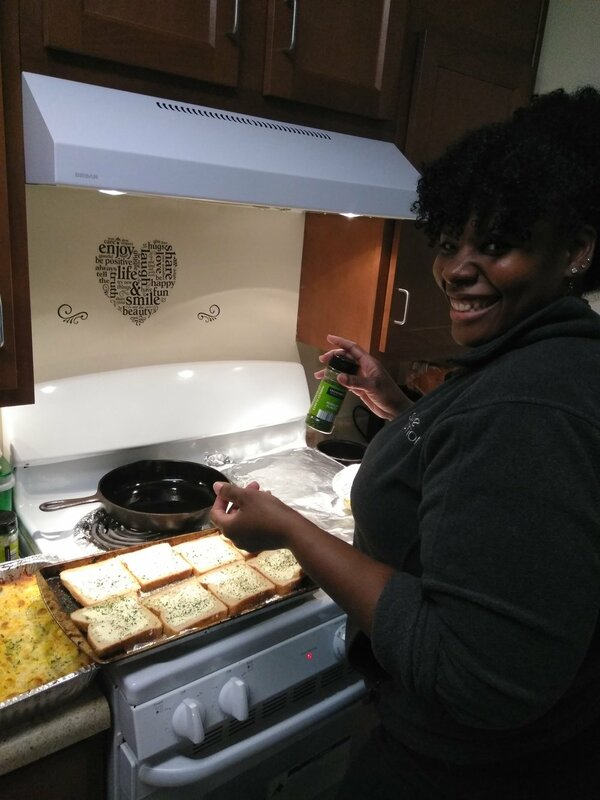 We prepared a veggie lasagna with garlic toast. I shared with the residents that they can be as creative as they want with dishes like this because it’s the beauty of cooking. I shared with them that I make my lasagna differently every time and enjoy the creativity of tasting various natural flavors from different foods. For this dish, we used squash, zucchini, eggplant, baby spinach, garlic, tomatoes, tomato sauce, red/green peppers, onions, parsley, herbs and spices, three kinds of cheese and of course you can’t forget the pasta. Oh my goodness, it was DELICIOUS! The best thing about socials like this is the creativity of preparing food. You don’t have to follow the recipe exactly. There’s no limit to the art of cooking. Taken for instance eggplant, most people wouldn’t eat it by itself but will gladly eat it when cooked in various dishes and mixed with other flavors. I printed out some nutritional facts about zucchini and eggplant and shared copies of three recipes that they could play around with. The idea for this cooking social came from a previous conversation that included cooking classes the Family Health Center offers. Several Smoketown residents were interested in the cooking classes, but the timing was an inconvenience. Evening classes are offered at the Portland location but would be inconvenient for the residents to attend due to lack of transportation. I suggested that we could start a cooking social that will meet their needs. They thought it was a great idea and I knew it be as well because it would tie into one of the initiatives IDEAS xLab Project HEAL (Health. Equity. Art. Learning) called “Hey Neighbor”. Hey Neighbor is an initiative that focuses on identifying the needs block by block in Smoketown while increasing neighbor interaction and community engagement. The first potluck was held in mid-December on the block where the Smoketown Laundry will be located (Breckinridge St between Hancock/Jackson St.) This block is identified as Block 1 and other blocks are also numbered. We identify how many residents live on the block, how many houses are abandoned, etc. Within each Block, there is a leader/point person and a co-assistant that will help with planning regular socials for their Block. Leaders are chosen based on the resident's decision to volunteer to be a leader. A discussion happens during regular interactions I have with the residents to inform them of community news and activities they can engage in. With this being the first cooking social, it opens opportunities for neighbors to interact with each other as well as me identifying needs, sharing news, and building relationships with the residents. Tony and I were excited to plan this event. He is a Smoketown resident that I connected with several months ago. He happily volunteered to host the cooking social in his apartment. One of the biggest challenges when it comes to planning events is, wondering if those interested will actually show up. His encouraging words ensured me not to worry about those who don’t show. Just focus on the purpose of having the social… I was so excited to know that this was coming together quite nicely when residents started to arrive. It was a blessing to have each attendee participate in preparing the meal. Some took notes on the steps of making the meal themselves. Depending on how many people you prepare for, the recipe will have to be altered. There were a total of five people including myself. Two of the attendees were cousins and that was very interesting to know because neither of them knew the other was going to be there. It was so awesome and makes you realize how small Louisville really is. Mrs. Rose Mary shared that she hadn’t spent time with her cousin in a long while. She explained that this is a fantastic idea and she looks forward to participating on a regular basis. As we cooked and ate together, we had various conversations around family, health, community engagement and the development of the Smoketown Laundry. We talked through the Smoketown Laundry survey (If you haven’t taken it yet, Click Here!). One of the residents shared how important it is for all of us to get involved in community meetings and raise our voices on what really needs to be in the community. Mrs. Valerie participated in the last Smoketown planning session and felt empowered to voice her concerns. We also talked about how it can be hard to be involved in community events when they don’t receive notices. I was happy to share that this is one of the barriers I’m trying to work with the community to overcome. That’s why my relationship directly with Smoketown residents is so important. I asked if anyone was active on social media, and shared how it’s another pathway to knowing what’s happening in the community. Only one person from the gathering is on social media, so, I encouraged them to keep a lookout for things posted on the doors and at the leasing office. And, to consider looking at SmoketownVoice.com or the Smoketown Facebook page. As we cleaned up after dinner, I looked around and was so thankful everyone enjoyed the cooking, sharing, and uniting with each other. A special thanks to Tony, the residents/friends that attending this wonderful event to make it a great success. Looking forward to continuing socials like this to building relationships with residents. A Community Potluck is scheduled on Tuesday, February 20, 6-8pm at Bates, 619 Lampton St.
Hope to see you there!! Please look below to view pictures of the social!! SMOKETOWN IS WORTHY OF EVERYTHING!